Python is a simple yet powerful programming language that’s a must for beginners and advanced programmers alike. Here’s why. High-level programming languages have one goal in mind: to make your life as a programmer easier. Messy syntax and obscure keywords? Forget about it. With languages like Python, you can get away with understanding just the basics of programming, enough to begin writing your own scripts and apps. And since Python developers are high in demand, Python is a great language to learn if you want to pursue a career in software development or big data. Clearly, it’s easier to pick up Python’s syntax; it almost reads like English. That’s precisely what makes high-level languages so great for beginners—they don’t expose you to any messy underlying functionality that you don’t need to understand. Python also has plenty of free libraries you can install for a variety of applications. For data science, you can install Python libraries that support data analysis, manipulation, and visualization. Many top companies worldwide have embraced Python in their development, either partially or wholly. Some of the big players like Facebook, YouTube, Quora, Dropbox, SlideShare, Pinterest, Netflix, Reddit, Disney, Yahoo!, Nokia, IBM, and others do most of their new programming in Python. Even Google uses Python as one of its three primary coding languages. 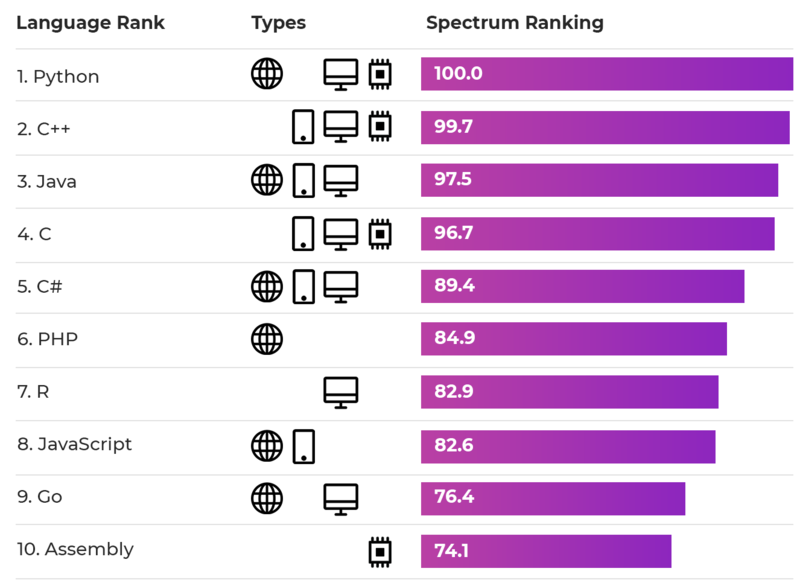 As we gear up for 2019, Python is quickly emerging as one of the highest-paying skills in the data science job market. Businesses are looking to onboard exceptional data science and programming talent; knowing Python (as well as data science fundamentals) will put you on their recruitment radar. Let’s take a look at some of the top Python jobs, as well as their average salaries. As the name implies, a reporting analyst sifts through data and reports their findings to guide organizational decision-making. Responsibilities: Analyze data. Create reports and presentations on their findings. Skills: Minimum of a bachelor’s degree. Data extraction, analysis, and transformation skills, as well as strong knowledge of languages like Python and R.
This job is perfect for an ambitious Python developer experienced in the development and implementation of software solutions. Responsibilities: Work with developers to plan, design, create, test, and deploy software. Skills: Advanced programming, technical knowledge, excellent grasp of computer and software fundamentals, strong communication skills, and proficiency working in a dynamic team environment. Organizations task data scientists with analyzing data and solving problems. If you choose to pursue a career as a data scientist, you’ll find that knowing Python will help immensely in data research, mining, and analysis. Responsibilities: Analyze complex data to propose innovative business solutions that cut costs or improve organizational efficiency. Skills: Advanced analytical skills, strong foundational knowledge of statistics, strong technical/computer skills, and excellent communication. A Python developer typically writes server-side weblogic and connects applications with end-user services. If you’re a competent software developer with strong Python programming skills, this role is perfect for you. Responsibilities: Front-end and back-end software development. Frequently writing, testing, and deploying scripts or entire applications. Skills: Software development and experience with Python frameworks (test, web, etc.). Python is in high demand, and it’s only becoming more popular. Adding Python programming or Python data science skills to your resume will position you as a strong candidate in highly competitive job markets. Interested in learning Python? Vertabelo Academy has a special course offer to help beginners master the Python language. Our interactive courses are curated by top industry consultants and qualified educators—you’re in good hands. Best of all, our courses don’t require prior knowledge of computer science or programming, and you can even try them for free. Enroll today to explore all that Python has to offer!